For the first time in a little over three weeks I finally got back to work on Sky again. I left off July 9, working through Chapter 3 again, because Chapter 3 leads into Chapter 5, and Chapter 5 leads into Chapter 7, which is where I got stuck. I have felt so lost for so long, I’d begun to wonder what was wrong with me. Then yesterday I had the vague memory that things had been as chaotic for me in the process of writing previous books as they are for this one. Particularly Return of the Guardian King. I can’t seem to find the writing journal I kept for that one — it might be in my trunk of memorabilia buried at the back of the closet…but I didn’t want to go to all the trouble — and spend all the time — of getting it out. That’s when I recalled that there was probably something up on my old blog which I began back in February of 2006. And the second one, There and Back Again, detailed a process of story generation that is very much like the one I’m in the middle of now. It was exactly what I needed to read, to recall that I just have to get something down, that it’s going to change, and that that’s okay. Sure, make it fit as best I can, make it as plausible and consistent as I can, but don’t demand a lot from a first pass. It’s just my way of getting some sort of framework sketched in. I’d forgotten that I was supposed to be sketching, and started getting perfectionistic. The thing I love about what I wrote in There and Back Again, is that it reminded me how uncomfortable and blind my process is. How I can have no clue what to do one day, way too many options, unable to choose and then the next day, one little thing seems to lead to another and before I know it I have a sequence. It reminded me of how I can look at what I’ve done, be dissatisfied, come up with some alternative ideas that seem to work and then be unable to write them. When I try they just lie there, dead and dull. Then after a couple of days, and a few seemingly minor tweaks, all comes clear. The chapter which formerly was “a disaster” and “ALL wrong” and “never going to come right” somehow comes right. One day it’s AWFUL and HOPELESS; the next I wonder what in the world I was thinking, because it’s clearly just fine. Reading through that post, being reminded of all that helped me get back into Sky today. I also received a number of hits from the Lord concerning the matter of priorities. First Pastor John taught on our number one priority in the Christian life being to grow in grace and knowledge of our Lord Jesus Christ. “Is that really your #1 priority?” he asked. Well, yes, of course it is, and I know that doesn’t just mean the daily reception of Bible teaching, it also means application of that teaching and, once one has grown enough, operating in the spiritual gift one has been given. 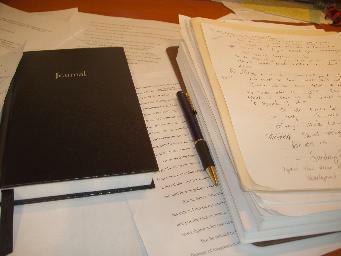 This entry was posted in Novel development, Progress reports, The Other Side of the Sky, writing life and tagged circling back, circular writing, priorities, time management, writing priority, writing the book on August 1, 2012 by Karen Hancock. It amazes me how easily I forget that I usually have to start out with the wrong words, the wrong slant, the wrong details… almost everything. And that I can’t get to the right ones without going through the wrong ones!